Additive manufacturing — also known as 3D printing — is a technology that enables engineers to fabricate three-dimensional solid objects of virtually any shape from a digital model created on the computer. In contrast to traditional manufacture using a milling machine, where an object is formed by a subtractive process that removes material from a solid block, 3D printing employs an additive process, where the object is created by laying down successive layers of material. In our field of medical devices, 3D printing has already made a major impact. At CapeRay we are working feverishly to complete the laboratory testing of our dual-modality Aceso system prior to initiating a clinical trial later this month. The breast-imaging device incorporates a pair of remote-controlled foot pedals that the radiographer uses to control the vertical movement of the imaging platform and compression paddle. Our industrial designer, John Harverson, utilized SolidWorks, a sophisticated computer-aided design package to create a 3D prototype that formed the “positive” for a silicone mould. The resulting foot pedals are an elegant feature of our user interface (see image at right). 3D scaffold printed using riboflavin. Copyright Regenerative Medicine. The real revolution in 3D printing of medical devices is taking place in the field of implants. Because the technology enables different anatomical shapes to be accommodated, a variety of prototypes have been printed: ears; heart valves; bones; blood vessels; and skin grafts. The challenge, however, is to create a prosthesis using fabrication materials that are biocompatible. 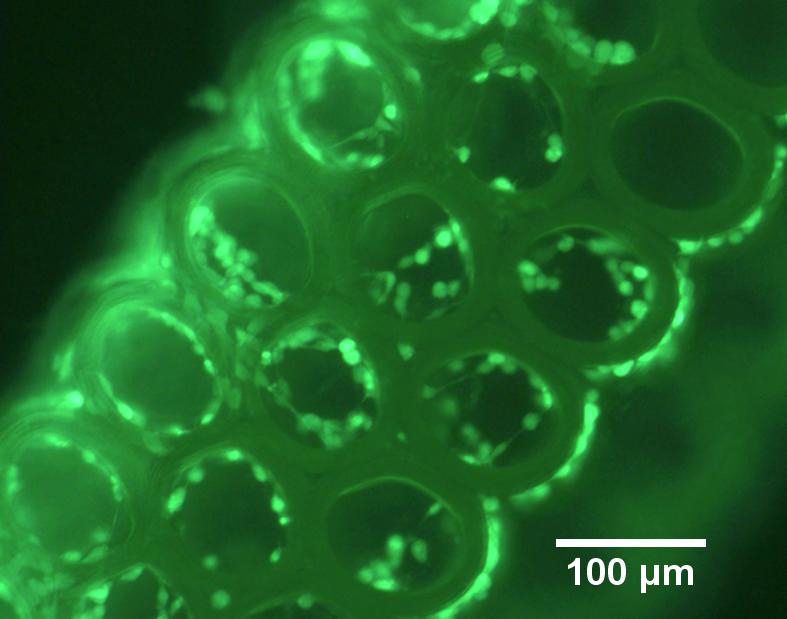 A biomedical engineer from North Carolina, Roger Narayan, has just published a paper in Regenerative Medicine in which he and his colleagues described the incorporation of a naturally occurring compound into a 3D printing process to create a medical implant. The compound was riboflavin, better known as vitamin B2 and found in everything from asparagus to eggs.